This week, I am revisiting some old memories! Last year when I was living in Sydney, we had a study break when we were supposed to work on a project. 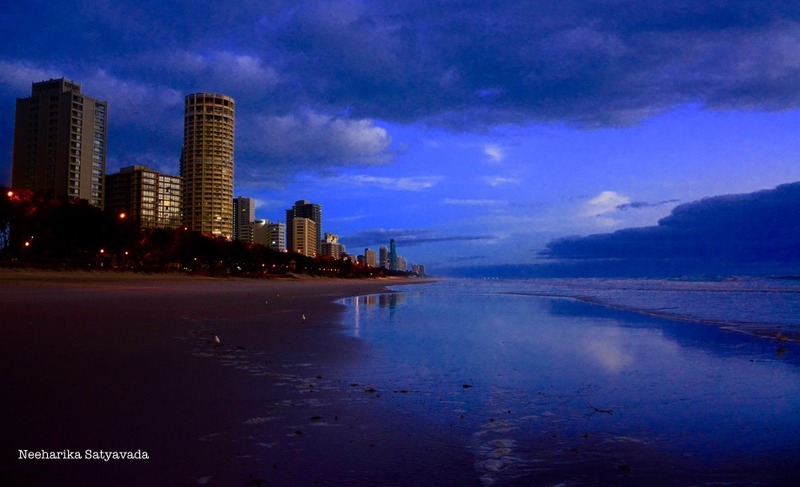 Instead a bunch of us (read most of the class) rented an apartment on Surfers Paradise in Gold Coast & took off. Some, including me took a flight, while other lucky ones drove down. Though I did miss taking the scenic route, I woke up to this! A Sunrise on The Beach. There I am in the living room, waking up, sticking my head out & see it getting light outside. So, I wake up others and we walk across from the apartment to sit on the beach and catch the sunrise. Each of us wanders off to pick a spot & indulge in some peace and thought. & Then, just like that, the wait is over. and a glorious dawn breaks. I believe a beach at this twilight hour has a completely different personality from when it gradually assumes its character as the day wears on. Do you know of any other beaches where one could wake up to the rising sun? Seeing the gorgeous pics…..can imagine what a mystical experience it must have been in real time! You have captured these moments so well……superb! So glad you liked the pictures. 🙂 I do hope that you always read my blog & share your thoughts on them. They keep me going. Thank you!